All Rights Reserved / Mafalda / The Silver Memoir. Powered by Blogger. Those who are part of this project may already have heard about our Flash Events. These are mainly to embrace a possible proximity despite distances, sharing different views and ways of love giving, and in the end I'll reward some of the most heartfelt entries. Already curious about it? I've got this 'thing' about mountains so it was pretty easy to get hooked on this beautiful picture by one of our partners in crime: Rita Neves. A lot of hearts and yeahs to this beautiful postcard, and let's read a bit about what snailmail means to her. Hello dear letter writers! How have you been lately? Since the beginning of 2016, things weren't always as good and smooth as I expected in my life. I've experience loss, distance, isolation and now I am experiencing something I hope to be like a reborn. Around March I was sure that I needed to find my path again, to reunite with the things that I love and that define who I am, in the end. I had to accept the things I can't change, and move forward to a better self. Hello everyone! How have you been? I have already told you some impressions about first letters, and what things I feel we should and shouldn't approach in our letter writing moments. 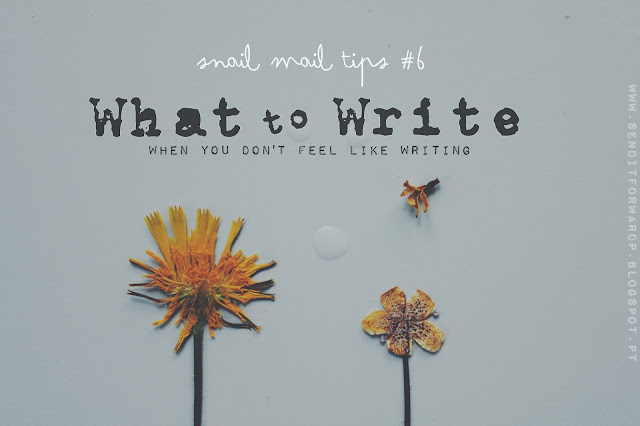 Today, I'll be telling you a bit more about what to write on your letters, or mostly, what I like to write and read from my pen pals. SNAILMAIL TIPS #5| THE SO CALLED "SNAIL MAIL STALKERS"
Hello everyone! How have you been? Today it was a cold rainy day. I spent it catching up with delayed work, mostly e-mails and trying to heal the most agonizing pain on my knees. For the past ours I was also exchanging some e-mails with pen pals about "pursuing already sent letters" and this is a most common and worrying thread than I imagined. I know I'm always mentioning how all snail mailers hate when letters get lost, or when there's a not so great pen pal who never replies. But there's also another thing that's a constant subject around snail mail communities; one I personally also struggle with myself. Every time I spend time preparing and sending a letter, postcard or parcel for a pen pal, I'm obviously always expecting for it to reach its destination safe and sound, but unfortunately not always things turn out as we expect. Anyways, I believe I all feel the same about things we wrote and crafted to send to another being, we want to know they'll be safe. More and more I see people around social media almost pursuing their pen pals, asking for letters and postcard arrivals, as I see people sometimes complaining about the supposed stalkers. I must admit I find it a bit offensive to see the whole thing as a "stalking situatuion", it just means that people actually care about what they're doing and sharing with the world. And I'm also speaking against me, because whenever I'm in between cities I tend to take some time to let my pen pals know if my letter arrived or not, but I make my best effort (even if I have to use a stupid post-it) to keep track of my mail, and to help others keep track of theirs. I feel really mad about noticing the lack of sense and common comprehension among people, especially when the solution seems so simple that makes me wonder if this post is even worth my time. The sad part is that it does. Last year I've sent several letter wish weren't answered for several months. Some of those I tried to contact to at least know if it had all arrived, but most of the times I wasn't lucky. Meanwhile I even sent second and third presentation letters, thinking about post services and such. Some were answered, yes - but, several months later, as if it had only passed a few days, making me feel instantly a bit lost and distant from that pen pal. And it does happen. It's a good thing to keep in touch with our pen pals. We already spend to many hours on Facebook away from the ones we are close too, do we really want to spend hours pulling ourselves away from those we are still meeting? I encourage all of you to always leave an e-mail, a facebook/instagram message to your snail mail friends, letting them know you've got their letters. It's not complicated and it'll only increase each others respect and consideration, as another brick to build a strong bridge between you and your pen pal. Hello dear everyone, how are you today? Here, the sun is misteriously shinning and the hot tea does seem too hot, already. Nevertheless, I'm still wearing my most comfortable grandma-knitted sweater. After being back to Oporto, for a long time, I came to Coimbra to spend a week, that most likely turned into a month. I came here to rest my heart and mind, and of course to work a bit. Then, life happened all over me, and somehow instead of that nostalgic feeling of home-need I was kind of overwhelmed by this strange will of staying some more time. Before, I was always feeling tired, busy and lonely whenever I was here, but somehow, this visit made a fresh start on standing my ground, and realizing that the place never mattered at all. So, I'm currently still in Coimbra, enjoying tea, books and brainstorming (- and exeriencing an awfull internet connection as well...). Also, I managed to recover my camera's memory card, so it's time for some mailbox love! I got some beautiful treats and the most lovely letter from Mandy! I already finished her letter and left it with granny along with others to send to her. I really loved all her delicate and colorful details and she has the most cute handwriting, it definitely made my day! Recently I could get in touch with some old pen pals that surprised me by magically appearing in my mailbox and I met a bit better the amazing Melek, from Turkey, one of my most recent pen pals. She cared to make me the prettiest flipbook, and sent me a teabag that instantly turned into one my favorites! I also finished my letter to her, and tried to make her a nice parcel as well. I can only hope she'll like it, and that it'll bright up her day! Notebooks are one of the oldest ways we know for keeping all the important stuff reunited into a personal compilation of what inspires us, what makes us, who we are. I'm a lover of notebooks since I can remember, handmade or not. My mother always boosted my love for writing, embellishing it with the most cute pieces of notebooks, still does and I let her. It's marvelous to walk around our own personal random writings sometimes, to find the things that changed and those that didn't. To re-encounter old memories, places and people. In my case that also is related to snail mail since I always take notes of several feelings, emotions and details about a letter or a pen pal. It's a way of making sure I'll never forget the way I felt in that moment. But not everything is a journal of feelings, or a personal introspective writing. I also collect inspiration from magazines, newspapers and such. I take note of my favorites on cinema, literature and music, and write down daily information such as tasks and important jobs. It's an interactive confuse biography of who I am, but which I can figure out just by taking a glimpse at one page. Have you chosen your notebook or notebooks, for this present year? What are your views on notebooks? What they mean and how they have a role in your life. I'd love to know more about it. Hello dear friends! There's a lot of freezing cold and rain happening outside, so in between blankets, letters and tea I bring you some Sunday inspiration with this beautiful caption found among the lovely contributions, through our main hashtag #senditforwardp. Here's a bit from Kelsey, Washington, DC. 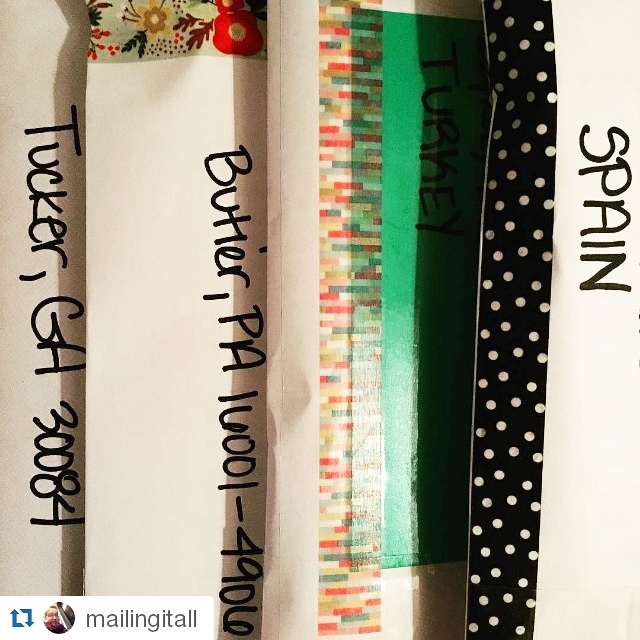 - Snailmail is... an amazing kind of self-therapy for me. As I pour myself into papercrafts and letter writing I can physically feel myself relax. I crank the music up and I dig in. I'm never surprised to find myself dancing around with washi stuck to my fingers. - I wish to send forward... as much love and hope as I possibly can. Each letter, postcard, and package I receive brings a smile to my face. A big one. Settling in to read a letter from a dear friend warms my heart. I have gotten letters that have made me remember what happiness is, brought tears to my eyes, and made me do victory dances. I can only hope that I have done and can do this for others. One story, something good that happened wich was provided by the joy of letter writing. When I moved to Washington, DC miles away from my loving mother living in Kentucky, I knew it would be difficult. Trust me when I say there have been many tearful phone calls and desperate texts seeking advice and comfort from both ends. Luckily, I have an amazing mom that finds the most spectacular post cards. (She's even sent me DC ones before.) She has become my most frequent penpal. Her postcards litter my bookshelves and mine plaster the fridge back home. Each time I get one in the mail it's like she's sent me a little piece of her saying hello. 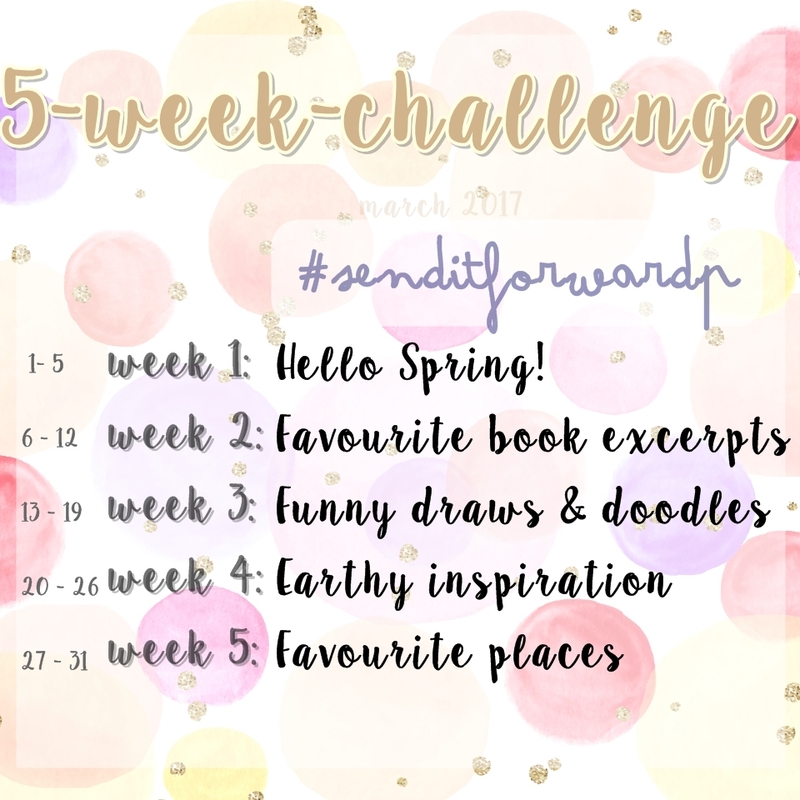 Feel free to join the community + Keep tagging your pictures with our hashtag #senditforwardp for a chance to get featured. Hello everyone! I hope you are going great, enjoying the first pieces of spring! Well, as you might guess for my recent absense, I'm dealing with much these days, and I'm preventing myself to tell a bit too much, a bit too soon. But of course not even the tremendous amount of wor or my companion named flu could keep me away from here, and especially from telling you the winner of our Fancy Paperie Giveaway. I used the Random.org number generator system to select one of you in the most random and fair way. I was really happy to see you all taing your chances, and I can't than you enough for maing this happen. But, let's get to what matters, our winner. The winner for our Fancy Paperie Giveaway is our dear friend Mariana Azevedo! - I hope she'll find so much joy in this little set! I remind you to follow Amanda's works and to keep an eye onto her The Fancy Paperie store on Etsy, where I guarantee you'll find more beatiful and delicious items, both for letters and stomach (her cookies look lie taen out from a Wes Anderson film). Make her a visit and enjoy the nice discount she is giving all of Send it Forward's followers by using the code MAF15, along the purchased items. A few days ago I was making some new postcards for my pen pals, and I decided to make a special post + "kind of an event" for all of our felow postcard hunters and collectors around the world. Around the snail mail world, postcards will always be the simpler but precious way of getting in touch with your friends, family and pen pals. I often send postcards just because I feel like to, and I know people will smile the moment they'll arrive. Nevertheless, postcard collectors are not always just people who are looking for postcards. So I'm here to tell you, according to my experience what kind of postcard collectors you may come accross, and such. Well, I am not picky at all when it comes to postcards, but of course I love when they come signed by the sender, at least Just to keep the person always in memory - even when I'm 99 years old. In general, I don't ask for any themes or types, unless of course when it comes to arranged postcard swaps. But, within all my years with snail mail, I have found all kind of peculiar requests among several postcard collectors. Some people just collect a specific theme. It is true, and I believe totally acceptable. And in the end it's not really hard to try and find a postcard your pen pal will find useful and nice for his/her collection. And,... it's not like we are returning the thoughtful postcards wich don't seem to fit in our collection, at least, I don't. Stamped and with recipient. This is one wich I found very common. Postcards collectors and swappers who love to keep those in it's used form. For example: with greetings, signed by sender, including post stamp. For those who are sending postcards as a gifts to a pen pal collector, you can always make it creative, and make a fake stamp and such. This way it'll look more real - and original - and a unique piece to your pen pal's collection. Handmade postcards. Mail-artists, for instance, do prefer these. Don't overthink it, and start acting all "I'm not an artist" because you don't have to. Mail-art is not only about showing your masterpieces, is a shareable act of your own creative imagination. To make it completely yours and give such part of you to someone is like a privilege, for both sides. Countries and Locations. 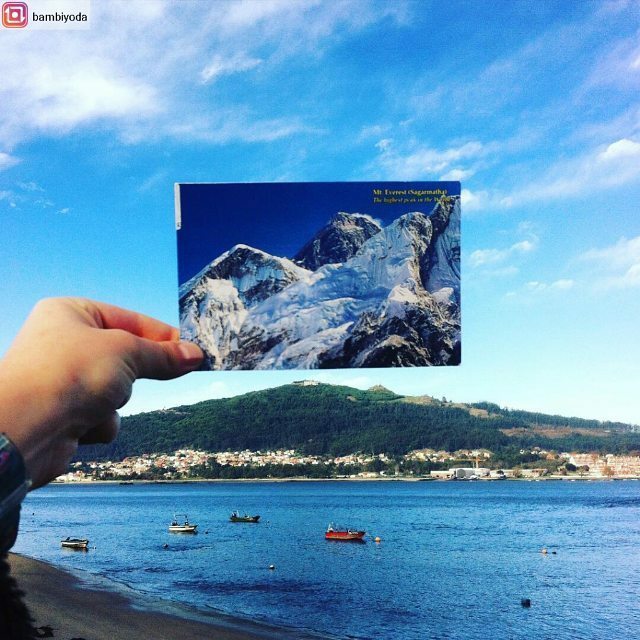 These are the most common around postcrossing, but is not only about having postcards of different places. Sometimes people want specific countries, or specific places or sites. When you have a pen pal who collects world postcards, be thoughtful to ask any preferences. It is always nice to help a fellow postcard hunter grow his collection. Vintage. Many people ask me for vintage postcards, and we all know real good why these are so special and filled with history. Nevertheless, some people seem to find those hard to easily find. My best advice is to ask for them in local antique stores, or old book stores. For example, both in Porto and Coimbra I know these nice places wich kept lost mail, envelopes, letters and postcards for several years. If I haven't asked I didn't even knew they were selling these precious items. So, if you are a vintage lover, run all the antique stores you know, talk to the owner and ask info on vintage postcards, because there's no one better for them to help you in a vintage hunt quest. Commercial. I had a pen pal with collected advertising postcards, those we get for free for time to time. She wanted to have it all, and I found it such an interesting collection that I actually started my own. Of course, I don't have as many as she does, but one day I'll get there. These, in Portugal, are often easy to found in several cafes, bookstores, and theatres; for example. There are also some places wich have a yearly postcard release with popular pictures. Hobbies and interests. Some postcard collectors end up gathering a lot of what they love, even if it is their work. For example, I met a wide range of creative snail mailers. Most of those, who were fellow postcard hunters kept a majority of postcards related to their areas of interest. As for instance, I own a very large collection of photography related postcards than any other theme. I met several designers wich love patterned postcards for example, and several art historians who are obsessed with famous paintings reproductions into postcards. Other popular themes are for instance literature related, celebrities, tv shows and movies, animals and nature. The chances are almost infinite. When sending postcards: I often send them into envelopes unless I'm asked otherwise. Why? Simple; because if I find a special postcard for a special fellow collector I don't want it to get lost, so I think a blank envelope always keeps it in a low file. But, of course, most people prefer to get them envelope-free, stamped with sending proof. Of course there are many other things wich can be considered as the criteria of every postcard collector, so the thing is to always ask your recipient for it's preferences and kindly tell him/her yours. But it's not everything for today - I have more news. Along with these considerations I created a new section for all of us, in this project. This is for all my dear fellow friends who love postcards as I do. Both participant and non participant can be a part of a postcard hunt list, surprising and being surprised by fellow postcard collectors. All you need to do is to fill the following form, and we'll get in touch. Keep in mind to be very clear on what type of postcards you collect and any kind of considerations and requests for your sender. And as for the letters, don't let your pal hanging. Only subscribe to this list if your are willing to enter in a postcard swap list, for receiving and sending postcards around the world. Any doubts or concerns please contact via psenditforward@gmail.com. I hope this will come in perfect time for all of you who asked me how to be a part of this project if you don't feel to write long chatty letters...Well, here is a way of sharing a bit of kindness while keeping a precious collection. Welcome to Send it Forward! This is a heartfelt project that unites letter writters and postcard collectors, into a kindred community. For those who love and wish to share smiles, love and kindness to unknown mailboxes, all around the world.